The Charlotte Glencross exhibition tour and talk has been POSTPONED DUE TO WEATHER. A new date will be announced shortly. La conférence et visite de l’exposition Charlotte Glencross prévue pour ce soir est ANNULÉE a cause du mauvais temps. Nous annocerons prochainement la nouvelle date. Our Krieghoff gallery (minus Merrymaking) and East Wing Galleries remain open, as well. Please note: 75 of our Masterworks, including Dali’s Santiago El Grande, are on tour and so no longer on display. This also, however, means that new works are on display in the East Wing and High Gallery! Join us for a tour and talk of the exhibition Charlotte Glencross: the Fabric of Her Life, with its curator, Vita Plume, and with art educator, Jennifer Pazienza, on Thursday, February 28 at 7 pm. Admission for this tour and talk is free! March Break Art Day Camps at the Beaverbrook Art Gallery! Daily art camps for children ages 5 to 12, March 4-8, 2013. These full day art camps for children ages 5-12 run from 8 am – 5 pm each day. Daily art activities include drawing, painting, printing, textile art, clay sculpture and mixed media, all inspired by current exhibitions. Cost is $30 per day for members, $35 per day for non-members. Where these are day camps, children can be registered for one, some, or all days. Please note that children must be in, or have finished, Kindergarten to attend camp. Children should bring a lunch, two snacks, and something to drink; they should dress for mess and fun, and indoor (non-marking) shoes are recommended. Please call our Front Desk at 458-2028 to register or for more information. Thursday Night Art Classes in January and February: During January and February, join Sandy Brewer for acrylic and mixed media workshops on a variety of topics, including novelties like collage over texture. All levels welcome, materials included. Les expositions sont: Trésors artistiques du Nouveau-Brunswick, Rêver d’ordre au milieu du chaos : Abstraction géométrique contemporaine, et Charlotte Glencross : L’essence de sa vie. Notre galerie d’oeuvres de Krieghoff (sauf Merrymaking), ainsi qu’une selection d’oeuvres de la collection permanente reste aussi ouverte. Veuillez noter, s.v.p., que 75 de nos chefs d’oeuvres ne sont plus en exposition, car ils sont en tournée avec l’exposition Chefs-d’œuvre de la Galerie d’art Beaverbrook. Cela veut dire, cependant, qu’il y a des nouvelles oeuvres en exposition dans la Galerie! Nous vous invitons a une visite guidée de l’exposition Charlotte Glencross : l’essence de sa vie, avec la conservatrice Vita Plume et l’educatrice artistique Jennifer Pazienza, le jeudi, 28 février à 19 h 00. L’entrée est gratuite; présentation offerte uniquement en anglais. La conférence prévue pour ce soir est ANNULÉE a cause du mauvais temps. Nous annocerons prochainement la nouvelle date. Camps de jour pour enfants agés de 5 à 12 ans, les 4, 5, 6, 7, et 8 mars 2013. Activités artistiques pour les enfants de 5 à 12 ans. Notez s.v.p. que les enfants doivent être en, ou doivent avoir fini, la maternelle. Toute la journée (8 h à 17 h) du 4 au 8 mars, au coût de 30 $ / jour pour les membres et 35 $ / jour pour les non-membres. Ces camps sont offerts uniquement en anglais. Les enfants devraient apporter un diner, deux collations, et de quoi boire; nous recommandons qu’ils portent des vetements qu’ils peuvent salir, ainsi que des souliers non-marquants. Appelez l’accueil at (506) 458-2028 pour plus d’informations ou pour enregistrer. Les cours d’art des jeudis soirs : Pendant les mois de novembre et décembre, rejoignez Sandy Brewer pour des cours de peinture acrylique et multimédia sur des sujets variés. Tous niveaux d’expérience sont les bienvenus, et tous les matériaux sont inclus. Cours offerts en anglais. Veuillez contacter l’accueil (458-2028) pour plus d’informations. Les sessions commencent à 19 h 00. In case you miss them, we’ll be collecting links to the Masterworks conversations with our director, Terry Graff, from CBC NB Radio One’s Shift right here! We’ll post links as we’re able for your listening enjoyment, so keep checking back for post updates. This lecture has been POSTPONEDdue to poor weather. A new date will be announced shortly. Join us at the Beaverbrook Art Gallery for a tour and talk for the exhibition Art treasures of New Brunswick with its curator, Virgil Hammock, on Thursday Feb. 21 at 4 pm. Soyez les nôtres pour une visite guidée avec Virgil Hammock, conservateur de l’exposition Trésors artistiques du Nouveau-Brunswick, le jeudi, 21 février à 16 h 00 ici à la Galerie d’art Beaverbrook. FREDERICTON (February 18, 2013) – The public is cordially invited to attend the opening reception for a new slate of exciting exhibitions at the Beaverbrook Art Gallery on Thursday, February 21 at 5 pm. February 1, 2013 marked a special day for the staff and supporters of Beaverbrook Art Gallery, as our Masterworks exhibition opened at the Society of the Four Arts in Palm Beach, Florida. This was the culmination of efforts over the past four years made by the Beaverbrook Art Gallery community, and we’re very excited to share the results with you! (l-r): Terry Graff, Nancy Mato (Executive Vice President and Curator, Society of the Four Arts), Bernard Riordon, O.C. “Surprised, excited, thrilled, thrilled would be a good word!” said Director and CEO Terry Graff about the opening reception of Masterworks, which was attended by hundreds of people. This marks only the second time that Dalí’s Santiago El Grande has left the Gallery since its installment in 1959. Its presence in the Masterworks has been a huge draw for audiences internationally. “At some openings people ignore the artwork and it becomes more like wallpaper for their social event, this was not the case at Palm Beach,” said Graff when referring to the reaction to the Santiago in Florida. 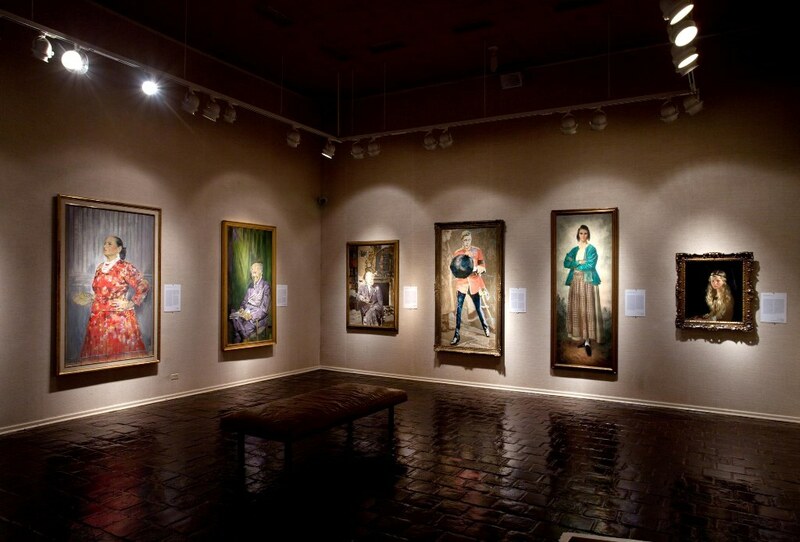 Part of the “Masterworks” exhibition on display at the Society of the Four Arts.